Complex global phasing, innovative launch/de-launch operations, maintain traffic throughout construction on busiest highway in Nova Scotia. The existing Shubenacadie River Bridges are twin 4 span structures, each with a total span of approximately 195 meters constructed in 1975. The structures are twin trapezoidal, steel box girders bridges with a composite, cast in place concrete deck supported on substructure elements, including 3 in-water piers, founded on end bearing steel piles.The two boxes within an individual bridge are linked by external cross-frames that do not line up with the internal cross frames of the boxes. The abutments feature a traditional expansion joint. The alignment of Highway 102 is skewed 20 degrees to the Shubenacadie River. Failure of the expansion joints at each end of each bridge allowed salt laden water to spill onto the steel superstructure below resulting in excessive corrosion of the ends of the steel box girders. Also identified were cracks in the webs of the box girders at each connection point of an external cross frame. The load carried by an external cross frame resulted in out of plane loading of the thin web plate resulting in a through thickness crack of the web plate. The cracks are a classic example of a distortion induced fatigue problem known as the “web-gab” detail. Further, HEC identified poor workmanship in the fabrication of the girders as well as overall poor detailing to address fatigue issues. 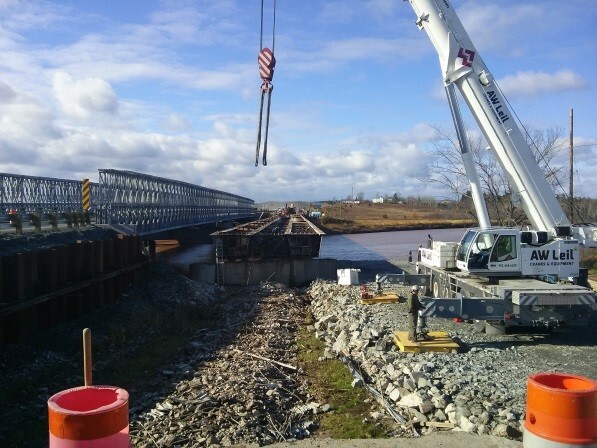 Phase 1 of the project included a full assessment of the existing structures including onsite inspections and steel thickness testing as well as a full structural analysis of the girders to determine the existing capacity of the bridge. The Phase 1 report included three options to address the problems with the structures complete with full capital cost estimates and preliminary construction phasing for each. Ultimately Option 3, full superstructure replacement was recommended by HEC and agreed to by NSTIR. 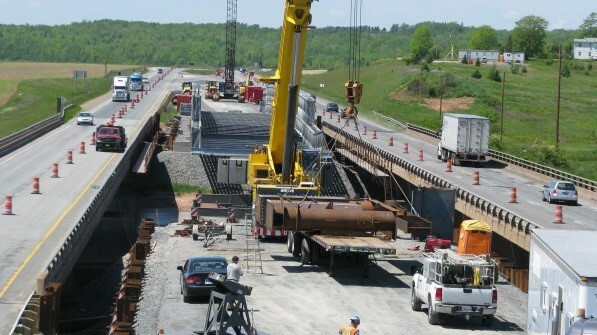 The bridge replacement scope included the design of new steel trapezoidal box girders and reinforced concrete deck, a condition survey and complete analysis of the existing abutments and piers to carry the new widened structure dead and live loads, all required rehabilitation designs for the existing foundations, an on-site detour located within the median between the two structures, the complete erection package for the replacement superstructures, the complete demolition design of the existing superstructures, and the detailed construction phasing. With the replacement of the southbound structure completed, divert traffic from the detour onto the new structure, divert northbound traffic onto the detour and repeat the demolition, erection and construction for the northbound structure. The new superstructures are wider than the existing bridges, resulting in an increased dead load on the foundations and allowing for the potential of a third design lane on the bridge. Coupled with this increased in-service load on the existing foundations, the innovative construction methodology developed by HEC involved the use of the central foundations of each bridge to also support the detour structure throughout construction (see below). During both the in-service (after construction) condition and the loads on the central piers during construction, apparent significant overstresses in the central pier piles were determined from HEC’s advanced analysis that included sophisticated finite element models of the piers. Based on this, HEC conceptualized several rehabilitation (pier strengthening) strategies in parallel to developing an on-site pile load test to determine the in situ capacities of the piles. Although it could not be definitively proven by analysis, it was felt by both HEC and the project geotechnical engineer that sufficient capacity was present in the piles to withstand the new load demands and negate the need for expensive in water work that would be required to increase the capacity of the center pier pile group. With the agreement of NSTIR, on site pile load tests were developed by HEC and the project geotechnical engineer and HEC took the project lead for the pile load test on site, hiring the contractor as a sub-consultant to HEC. Results of the pile load test indicated that there is more than enough capacity in the existing piles to withstand the construction and in-service loads of the replacement structure, resulting in significant cost savings for the client and eliminating the need for expensive and time consuming in water work. In fact, negating the need for in water work carries over essentially to the entire project. The use of launch and de-launch technologies, the rehabilitation of the existing foundations, and the use of the central piers to support the detour structure over the water are all strategies to deal with the congested site, eliminate the need for expensive in water trestles and large sheet pile closed cofferdams. The two span temporary panel bridge detour structure is a total of 122 meters long and has been designed to fit between the two existing bridges. 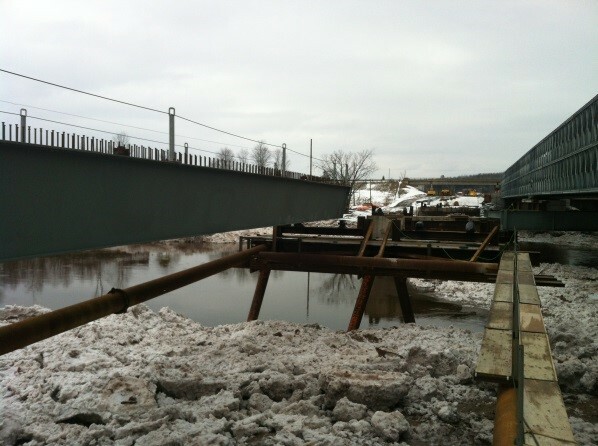 HEC has developed an innovative central support that spans between the existing central piers of the two highway bridges, is supported on steel gantry structures founded on the pile caps of the piers and eliminates the requirement for an expensive temporary pier that would be subjected to large ice forces. As an added bonus, the support structure was designed as two 19.34 m long, 1.8 m deep plate girders complete with bolted bracing connections, that will be cut in half (depth wise) after construction, and new flanges welded on to create four steel plate girders that will be used for a small river crossing bridge replacement project elsewhere in Nova Scotia. Over 80 detailed design and construction phasing drawings were developed by HEC for this technically challenging and complicated project. The level of detail and completeness of the tender package proved invaluable as the winning construction bid was $150,000 less than the $22M capital cost estimate developed by HEC during the design stage of the project.